Flensburg-city.de is a Google Maps based visitors guide for the city of Flensburg in Germany. 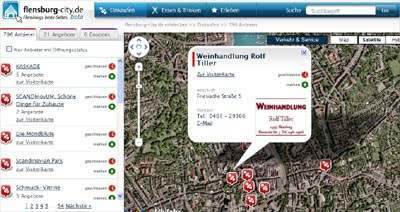 Citizens or visitors to Flensburg can search for shops, dining and drinking establishments or tourist attractions directly from the map. A very handy feature of the site is the personal bookmark option which allows you to create your very own shopping itinerary. As you browse the site you can add shops you wish to visit and save the list to view on your mobile phone. Klettervz is a German web based mountaineering community. The site uses Google Maps to show the locations of climbing locations in the country. Using the site you can build your own climbing routes and share them with other members. If you select a climbing location from the map you can view details about the climb, view photos and read comments about the climb from other users.